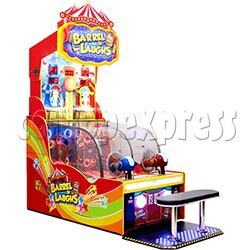 Barrel of laughs Air Gun Ball Shooting Game is a cooling air gun shooter ticket redemption game machine, suitable for single player or two players ball shooting challenged game, attractive with cute clown and carnival graphic designs, features with a automatic launcher shoots balls out system, and come with a rolling wheel keep moving as obstacles to avoid the ball go in the barrels, that keep the game play exciting. Players control the air gun, views and shoots small balls faster to hit 10 different targets to drop the clown into the barrel, hit targets as more as to win scores for the corresponding tickets. More targets was shot, more tickets player gets.